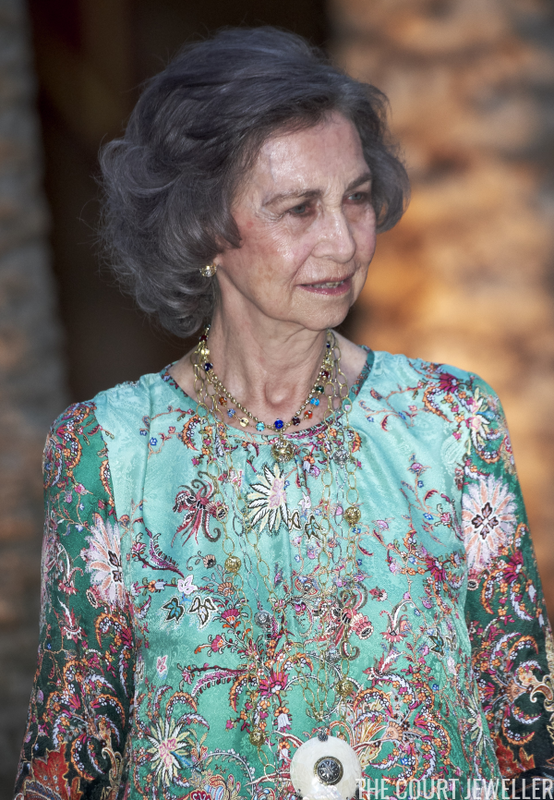 The Spanish royal family is currently enjoying their annual summer holiday in Palma de Mallorca, and both Queen Letizia and Queen Sofia have been sporting some lovely jewels during their public appearances this week. 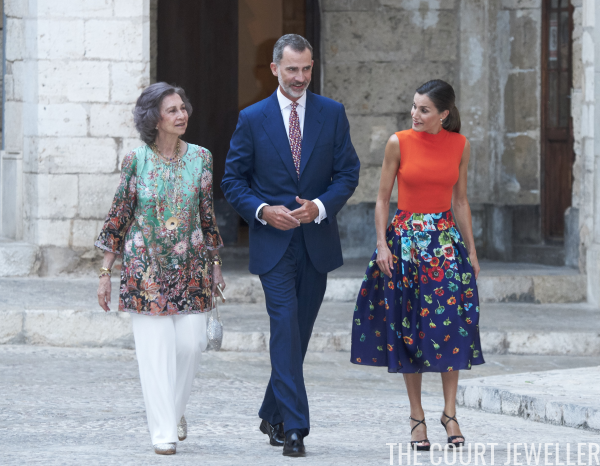 On Friday, King Felipe, Queen Letizia, and Queen Sofia held their annual dinner for local authorities at the Almudaina Palace in Palma de Mallorca. 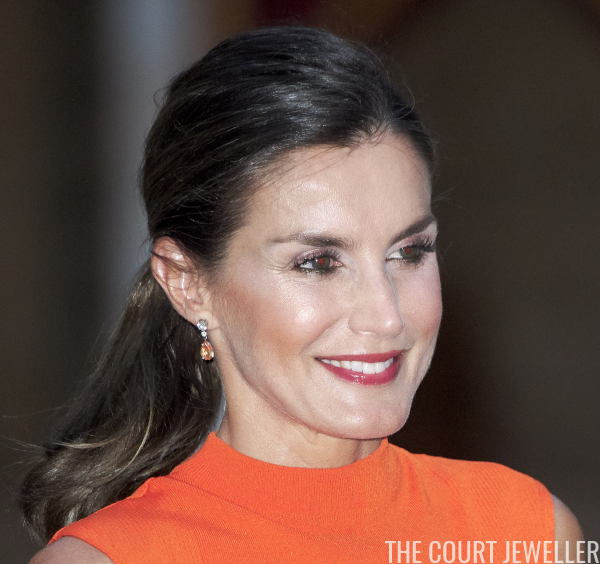 Letizia accessorized her vibrant orange top with a pair of sparkling earrings featuring orange gemstone drops. 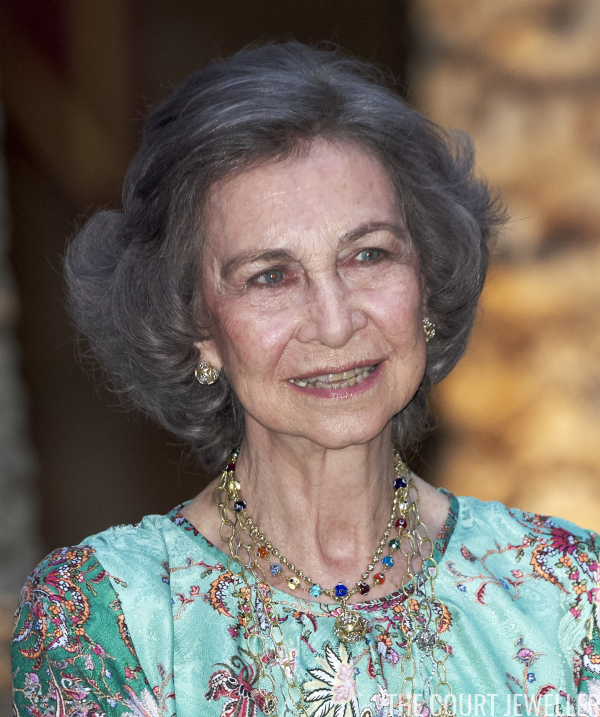 Sofia went with her trademark layered jewels -- lots of them! Her gold and diamond earrings matched the pendant on one of her many necklaces. 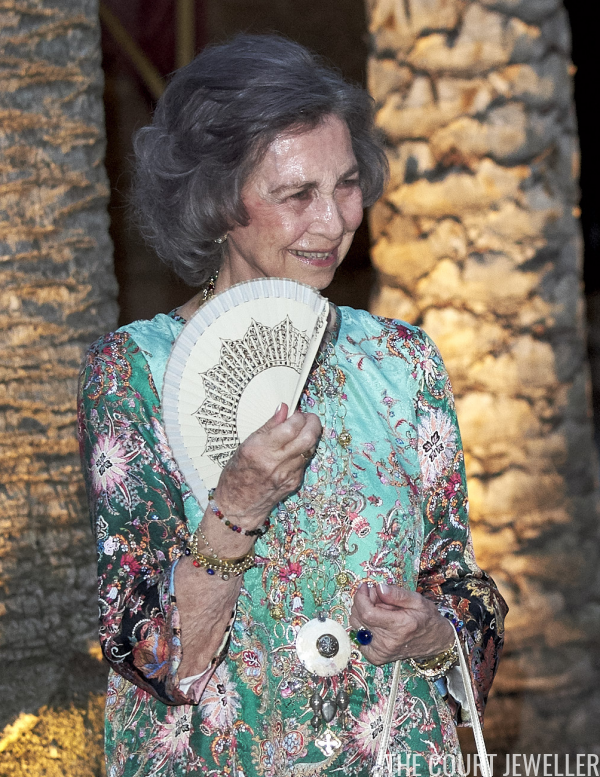 She even layered two longer, sautoir-style necklaces with her outfit, including one with a large pendant. 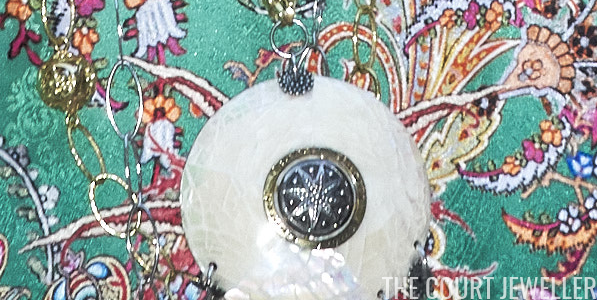 Here's a look at the top portion of that large pendant. One more look at Sofia's jewels. You can spot her stacked bracelets here, the bottom of that large pendant, and -- my favorite! -- that enormous cabochon sapphire ring. Gorgeous! 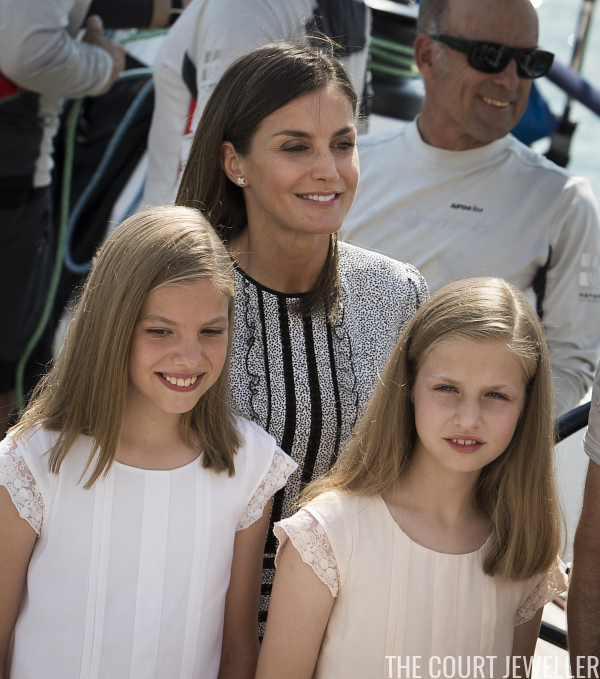 On Saturday, Letizia and her daughters headed for the harbor, where they picked King Felipe up at the end of the last day of the 37th Copa del Rey Mapfre sailing cup. Letizia, pictured here with Sofia and Leonor, wore her Chanel star stud earrings for the day. Here's a look at Letizia's summery outfit for a Saturday near the water. They may be on summer holiday, but official duties don't stop for Felipe and Letizia in Palma de Mallorca. 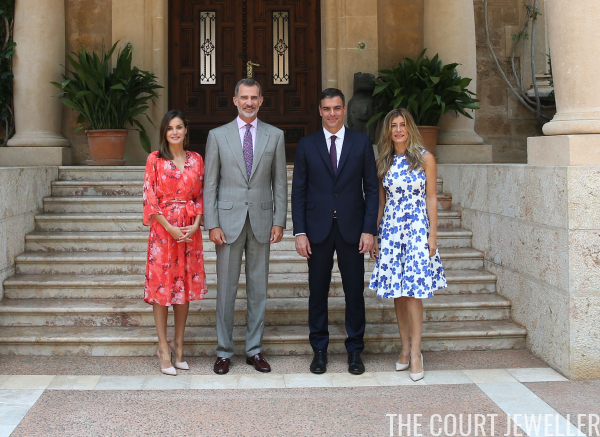 On Monday, they hosted Prime Minister Pedro Sanchez and his wife, Maria Begona Gomez Fernandez, at Marivent Palace. The event brought us another sighting of Letizia's threader-style star earrings, which feature a golden star stud and a gold chain dangle.